Let Them Sell Their Lemonade! "Mom, mom, mom!! We're going to go outside and set up a lemonade stand!" Ava proclaimed, as she and Madison, the neighbor girl, stood in the kitchen staring at me and waiting for a response. "Uh..." my mouth dropped and no words came out as I processed the newly formed and unexpected plan for the afternoon. I was carefully and quickly attempting to edit the freight train of "No!" thoughts going through my mind. We live on a dead end street! I don't have a table to put outside. I don't even think we have lemonade in the house. Mommy doesn't have a plan for this. And if you don't have a plan...well...then...You can't just open a lemonade stand on a random Saturday afternoon on a whim. You just can't. Despite my wanting to say, "No", something in my spirit knew better than to do so. Better than to squash their innocent idea when I really had no legitimate grounds for snuffing it out. "I have a sign and my mom has lemonade," Madison chimed in, perhaps interpreting some of the hesitation in my lack of response. "But girls," (I'm embarrassed to admit that I even said this, I should have been their cheerleader, but quite frankly didn't have the energy to engage in a lemonade stand at the moment), "We live on a dead end street. No one even comes down here!" "Oh well, we'll see!" They said, "See you later!" I let them run outside with their bundle of enthusiasm. They bounded next door, where they gathered supplies and 'set up shop'. Kudos to Julia (Madison's mom), who jumped in with a more cooperative spirit than her naysaying neighbor (though, she did later admit that she was a wee bit skeptical as well). She found Madison's sign, pulled out a green plastic tupperware bucket to use as a table, and made a pitcher of lemonade, which the girls decided they were going to sell for...brace yourselves... $1 per cup!! "Girls!" I said (not learning to keep my mouth shut yet! ), "$1 a cup? That's quite steep isn't it?!" "We don't have any change...and...they're big cups," Madison confidently explained. I handed them their first $1 and a pouch to keep their money in. Then...well, I said nothing more. I helped them situate their chairs and the sign and bid them good luck as I went back into the house to finish cleaning the kitchen, and feign innocence when they started haggling the neighbors for $1 per plastic cup of lemonade. "Katie! Ava's outside with the neighbor jumping up and down with a lemonade sign and listening to crazy music. They're trying to sell lemonade for $1!" "Lisa, let it go. Let them be kids," my sister wisely told me. I let it go. I let them be kids. They sold their lemonade for two hours and you want to know what?! They made twenty eight stinkin' dollars. Yes, you read that right...$28! The mailman gave them $5, every car that wound up turning around at the end of our dead end street bought a cup of lemonade, and several of the neighbors supported their efforts as well. They earned some money and mommy earned a lesson for the day. I learned that there are times when my big person thinking can limit my little people's ideas. Times when my "responsible", structured, adult perspective stands starkly in the way of my little people's enthusiasm and creativity. Times when I just need to keep my mouth closed and let my kiddos run with their idea. To let them see where it will lead. To let them realize their own successes, failures and everything else that they will experience in-between. Funny thing is that I am the first one to claim that I want them to follow their dreams, and passions and good ideas. I want them to put effort behind their inspirations. I want them to try. And try. And try. Trying is how we learn to live. Trying...sometimes with a structured plan, and sometimes without...is how we learn to run, walk, leap and fly. You can try as long as it is neat and orderly...and NOT MESSY! is what I can tend to communicate sometimes. We all have our list. Our list that reflects our limits of what we feel like we can handle on a given day or what we have the energy for. What if, with the summer months just about here, and many of us at home more often with our kids, we lift the limits. ...the the mess that will come along with it. 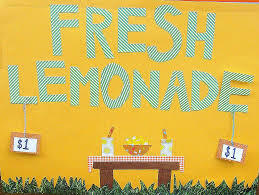 ...to the uncertainty of whether or not lemonade will actually sell on your dead end street or not. Except, some small part of our kids spirits when we, in our big people thinking, end up saying "No." Let them sell their lemonade!! !